Learning how to lose is also a part of leadership. Roger Federer, 26 years old and the 2008 Wimbledon Men’s finalist and top seated player on his way to a record breaking Wimbledon win, lost the match. It was one of the greatest Wimbledon matches I’ve ever watched. It was that 2008 Wimbledon final between Nadal and Federer, about 62 games, 5 sets, about 7 hours of tennis, 1 winner 1 loser. I will always remember that match. I’ve only ever bought a tennis dvd and this was it. After his loss, Federer stated, “I’m disappointed, and I’m crushed,” “He played a super match, and I’m sure it was a great match to watch and to play, but it’s all over now. I need some time.” In defeat, fighting back tears…he was still gracious. Tennis is an individual sport but Roger exemplified class. This is probably why Roger is heralded as one of the greatest tennis players ever. Daniel Cormier on Jan 3, 2015 lost the heavyweight UFC title fight to Jon Jones. This was an emotional personal fight. Daniel wanted this fight. Daniel felt that there was no way he could lose, but he did. After the fight, in an interview Daniel Cormier said, “He was better today, you know? He beat me. He won the fight. He’s obviously the champion for a reason and he showed it tonight.” In another interview with watery eyes, he later said, “I’m going to face that man again.” I gained so much respect for him when he said that. I mean, he gave respect but it didn’t defeat him, yes he lost but he wasn’t defeated. Daniel Cormier is now the champion and Jones is the challenger, scheduled to fight on April 23rd. As this NFL season ended with its greatest game of the season, the super bowl. A 100 million viewers watched the contest of the best two teams. In those millions, there were 30 other football teams that were home watching the game wishing they were playing. There are 53 players on each team in the NFL. So there were about 1,590 other players that play 16 games in a regular season to get into the Super Bowl. Regardless of how much weight they lifted, how many practices, plays, injuries, there was to be only two quarterbacks on the field for the super bowl, and one had to lose. I watched Cam Newton, the losing quarterback, hoping he could hold it together, be gracious. It’s a hard task for anyone in that position but there had to be a losing quarterback and it was Cam. Cam was the division champion, he had a phenomenal year but the Denver defense was incredible, they dominated. I felt bad for Cam, but I was more concerned about how he would manage this disappointment. He answered the questioned with as much patience as you can squeeze out of a losing spirit. He walked off abruptly, but he did enough. I know as a young black quarterback there’s an extra scrutiny without the benefit of any sort of compassion, especially when you were confident, not cocky, just confident. The establishment is not ready for a confident black man. As a black man there are different set of rules for you, imposed by white and black people. There’s always going to be a latency of scrutiny with everything you do outside of other people’s comfort zones, white or black, ask our President. 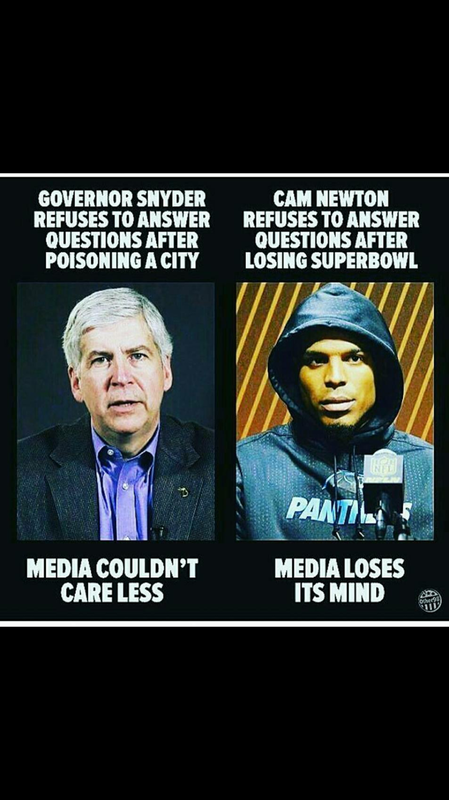 I’m not saying Cam was wrong or right in how he handled the press. I’m saying that, learning how to lose, is a part of leadership. It’s not easy for anyone to accept defeat of any kind. It’s a testament to your character to pay respect to the winner. Cam did that. If they beat you, no excuses, no pointing the fingers, just be honorable in your loss, allow it to motivate you. Use the scrutiny to drive you to a bigger goal but always be gracious. Understand the rules are different for young black men, but that’s why God made you black, because you can take it.